Penn State researchers have developed new highly slippery surfaces that do better than natural surfaces like the leaves of the lotus flower. Enhancing the mobility of liquid droplets on rough surfaces could improve condensation heat transfer for power-plant heat exchangers, create more efficient water harvesting in arid regions, and prevent icing and frosting on aircraft wings. "This represents a fundamentally new concept in engineered surfaces," said Tak-Sing Wong, assistant professor of mechanical engineering and a faculty member in the Penn State Materials Research Institute. "Our surfaces combine the unique surface architectures of lotus leaves and pitcher plants in such a way that these surfaces possess both high surface area and a slippery interface to enhance droplet collection and mobility. 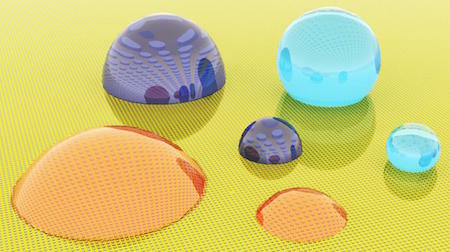 Mobility of liquid droplets on rough surfaces is highly dependent on how the liquid wets the surface. We have demonstrated for the first time experimentally that liquid droplets can be highly mobile when in the Wenzel state."